When Dora Bakoyannis became Mayor of Athens in January 2003, much of the international media predicted that the city would not be ready to host the 2004 Summer Olympics. Some commentators even went as far as to suggest that an alternative host city needed to be found. Yet 18 months later, in the summer of 2004, Athens hosted the XXVIII Olympic Games, with athletes from 202 countries taking part, to worldwide acclaim. In an interview Mayor Bakoyannis explains how she plans to build on the city's Olympic success to make Athens one of the great capital cities of the world. Question: How has Athens changed since you entered the Mayor’s office in January 2003? How does the city look in the post-Olympic period? Mayor Bakoyannis: I think you only need ask the Athenians, who live and work in the city. I believe the Greek capital is vastly different to what it was in January, 2003. We achieved our goal of transforming Athens, not simply its image but starting from the ground up. We upgraded infrastructure, improved the functionality of the city, brought colour back, made it cleaner and greener, created more parkland, but most importantly, provided a better quality of life for its residents. Roads and public spaces along 450 major streets, covering 750,000 square metres, were renovated and remodelled. Pedestrian walkways comprising a total of 250,000 square metres were repaved and lighting was ameliorated along some 200 roads. We planted over 350,000 plants and flowers and more than 11,000 trees in parks, squares and along pedestrian walkways. One of our key priorities was to treat building facades to a makeover. More than 2,300 facades  many of them neoclassical - have been repainted as part of our ongoing façade renovation programme, which began in mid-2003 and has proved to be a great success. Homeowners have taken advantage of the incentives to have their residences repainted. Not only does this add to the value of a property, at little cost to the homeowner, but contributes to the upgrading of the neighbourhood. This programme is continuing, and we expect that hundreds more buildings will be renovated in the coming months. Private companies sponsored the revamp of a number of city squares, which have always acted as central meeting points for Athenians. The municipal police force, whose job it is to make sure the city is functioning smoothly, was expanded with the hiring of 500 officers. They are responsible for ensuring anti-litter laws are respected, checking that establishments abide by health and hygiene laws, as well as enforcing parking and traffic regulations. We took on more waste management personnel, boosted our fleet of garbage collection vehicles and introduced steeper fines for those who litter. We are also happy with the progress of our 1.8-million euro stray dog programme, which entails the collection, sterilisation and adoption of strays. A vital element of this programme is our initiative to raise public awareness of the fact that pets are a lifetime responsibility. Question: Do you feel the City of Athens saw a return on the great amount of funding and effort it invested in the Athens Olympics? Mayor Bakoyannis: Our administration invested 110 million euros in projects, mostly related to infrastructure, ahead of the Games that were essential for the city. I believe that citizens feel it was money well spent. The Olympics did not mark the end of an era. On the contrary, they represent the start of a new one. The Games set the tone as to how we should proceed from this point onwards. At the municipality, we continue to work just as we have done up until now - methodically, in an organised fashion and adhering to strict schedules. Our administration has successfully cooperated with the private sector on many levels in order to achieve the best possible results in both qualitative and financial terms. I can proudly say that we are committed to continuing this collaboration in the future. The city’s new infrastructure and its successful hosting of the Games demonstrated that Athens is a capital of world-class standards. Now that Athens is equipped with modern facilities and services, I am confident that there is great scope for further development and investment in the post-Olympic period. Question: Do Athenians believe the difficulties of preparing for the Games were worth it in the end? Mayor Bakoyannis: I’d like to stress that it is thanks to the citizens of Athens and Greece that the Games were such a success. They patiently endured the construction works and showcased Greece and its hospitality to the world. Greeks have a singular attachment to the Olympics in that the event was born here. So succeeding in hosting excellent, safe Games was indeed a “national affair”. Last year, Athenians responded very enthusiastically to our call for volunteers to inform visitors during the Olympics and Paralympics. We had 3,650 volunteers dressed in bright yellow T-shirts bearing the phrase “City of Athens: May I Help You?” Most of them were stationed at information booths throughout the capital. We had volunteers of all ages, most of whom spoke at least one foreign language, representing 32 different nationalities as well as Greeks from abroad. I am extremely proud of this initiative, as it involved people and enabled citizens of all backgrounds to play an active role in a historic event, to welcome our guests and show them our city. As this programme proved a great success, we decided to set up a permanent volunteer scheme. In May this year we initiated our “Volunteer for Athens” programme, which foresees the involvement of 4,000 citizens. We aim to nurture the growing spirit of volunteerism in Greece and encourage residents to play a dynamic role in their city, making it a friendlier, cleaner and safer place to live. The first phase has already begun, with participants staffing the visitor information booths in summer and helping maintain recreational areas and parks, while a select group will be trained to assist in emergency situations. This summer, our information booths are operating at key locations around the city. Visitors can seek advice from our volunteers on what to see in Athens, such as the ancient monuments, museums and art galleries, as well as the bustling neighbourhoods of Gazi and Psyrri, which are filled with entertainment and dining choices. Our guests can learn how easy it is to travel around the city using public transport and pick up a programme outlining the free arts and cultural events organised by the City of Athens throughout the summer. The Games experience showed us that if we work as a team  something that we Greeks tended not to do in the past - we could achieve anything. We have a renewed sense of self-confidence. I believe that most Athenians now look back on the Games with pride but also with a sense of optimism for the future. Question: Has 2005 been a “tight” year from a financial point of view, considering the enormous amount of money expended in 2004? Mayor Bakoyannis: Like all countries hosting events of such magnitude, Greece has a debt to pay off and a key reason for this is that the Olympic venues and other works were funded by the state. The government spent $1.39 billion on security for the Games, the first held in the post-9/11 era. In the case of the City of Athens, our budget was carefully balanced. We have made a great effort to ensure that the city’s finances are at their healthiest ever. The municipal administration has taken full advantage of European Union funding made available to local authorities. In 2003-2004, the City secured 23 million euros in EU subsidies, up from just 1.2 million euros in 2002. We increased the City’s investment activity from 18 million euros in 2002 to 91 million euros in 2004. Revenue increased at a fast pace partly because we motivated those in debt to the City to pay up. We managed to cut spending and obtain a new loan at a very competitive interest rate. Question: Last year you said Athens was “a city that had been reborn”. Do you feel that this renaissance is continuing? Mayor Bakoyannis: Our focus is now on upgrading city neighbourhoods, expanding our network of parks and recreational areas and further improving quality of life. We are doing this in several ways and it includes upgrading our services, facilitating citizens’ day-to-day dealings with the City, building on our social welfare programme and improving traffic circulation. We are in the process of creating a Greenery Network that involves transforming unused space into parkland. In May this year, we launched a new institution, “Springtime in the City”, which included workshops for youngsters to raise their environmental awareness. We are also encouraging citizens to “green” their rooftop or balcony with flowers, shrubs and organic fruit and vegetable gardens. In June we introduced a four-month pilot recycling programme which, in its first phase, will deal with packaging waste and printed paper. For the city authority, but also for me personally, recycling is not an environmental policy. It is a way of life, beneficial to us all. Not only is it beneficial to the environment, but it is also a way of conserving energy. The development of an effective recycling scheme, particularly in a densely populated city like Athens, is a challenge even for countries with greater experience and resources than Greece. Our goal is to raise awareness among city residents about the need to recycle and to implement a programme that can bring us effective results. We are very satisfied with the way residents have responded to the recycling scheme. We work closely with the youth of this city and have set up a City Jobseekers Network, which is complemented by a series of initiatives intended to create jobs and promote private enterprise. For me, another vital project is the creation of the City of Athens Centre for Drug Rehabilitation and Treatment “Epilogi”. We are funding the establishment of a modern, fully equipped centre. Our objective is to encourage the rehabilitation of dependent individuals by literally putting them in touch with the land. Our motto is “Winning in Life”. With the support of the health ministry, we aim to arm them with agricultural skills so that they can find employment and become productive members of our society. Migrant issues are at the top of our agenda. Foreigners residing and working in our city make up one-fifth of the city’s total population. We’ve worked hand-in-hand with non-governmental organisations to draw up a realistic and far-reaching migrant policy that supports foreigners and builds bonds between residents. We are particularly interested in celebrating the multiculturalism of Athens, so we work very closely with ethnic groups and cultural associations. For us, this is a way of breaking down cultural barriers and bringing together the city’s many nationalities. The City’s new Migrant Service Centre and our foreign-language radio station, Athens International Radio 104.4 FM, which broadcasts in 12 languages, are perfect examples of this. The City of Athens recently set up a non-profit Tourism and Economic Development Agency in cooperation with the private sector. Through this, we aim to raise the Greek capital’s profile, boost Athens’ competitiveness as a year-round tourist destination, promote foreign investment and encourage sustainable tourism development. In previous years, Athens was simply a stopover for those heading to the islands. Today, the Greek capital is a perfect city break destination. I firmly believe that promoting Athens’ tourism industry is vital as the sector has the potential to stimulate the city’s wider economic development. Question: Though the Athens Olympics were internationally lauded as a great success, you are obviously not one to ‘rest on your laurels’. Today, how are you tackling the everyday problems of your city? Mayor Bakoyannis: Having fulfilled our commitment to complete large-scale infrastructure projects ahead of the Games, we can now focus more closely on day-to-day issues. This is one of the most interesting aspects of my job as Mayor  the contact with the man or woman on the street and the ability to resolve issues quickly and decisively. One of the most effective direct lines of communication between the City and its residents is our Citizens’ Helpline (195). Citizens can call and inquire about any matter relating to the municipality and its services. They are guaranteed to receive an answer in the shortest possible time. Making Athens, a 3,000-year-old city, accessible to people with disabilities was indeed, and still is, one of our greatest challenges. For me, it is a personal challenge as I have firsthand experience of the difficulties that people with disabilities face in their day-to-day movements around the city. Whenever I approach or enter a building, I automatically check how accessible  or inaccessible  it is, as I always have my mother, who travels via wheelchair, in mind. The city now has sidewalks fitted with non-skid tiles, 65km of special grooved walkways for the visually impaired and over 1,100 wheelchair access ramps, facilitating the movement of wheelchair users as well as of the visually or hearing impaired. We have improved accessibility to municipal buildings and also advise local businesses to do so. We definitely have plenty of work ahead of us, but I believe we have made a very good start. We consider it vital, however, that all Athenians understand the importance of such efforts, and show respect for their fellow citizens by parking where they should. Question: Do you think that Athens still would have improved so dramatically if it had not been for the Games? Mayor Bakoyannis: Honestly, the Games did motivate all parties to rapidly complete projects, such as the motorways and Metro, which would probably have taken a lot longer to materialise. If one looks beyond the national pride and the infrastructure, one can see a booming future. The Greek capital is now on a par with its European counterparts. Athens has radically improved in terms of efficiency and functionality. It has first-class transportation, telecommunications, business and tourism facilities, complemented by a highly skilled, multilingual workforce. Investors and international companies would do well to consider all of these advantages, which are complemented by excellent weather, easy access to the islands and mountain regions, and a wide range of cultural attractions. Question: What advice would you give to cities preparing to host Olympic Games, including Beijing and London? Mayor Bakoyannis: Don’t waste a single minute. You will need the full seven years to prepare for the Games. Security, funds and organisation are definitely key factors for good Olympics, but success is all about participation. It is important that the people are directly involved as they are the hosts. I am certain that both Beijing and London will host excellent, safe Olympics. Question: What does Athens now offer as a holiday destination compared with its competitors? Mayor Bakoyannis: For those who have not been to Athens recently, they can expect to experience a totally different city. A wonderful surprise awaits those who have never visited our city. Athens is a modern European capital that combines the wonders of the ancient world, like the Roman-built Herod Atticus theatre, with the modern, such as the imposing Megaron Concert Hall, one of Europe’s largest. The Olympic Stadium, whose roof was designed by Spanish architect Santiago Calatrava, is  for me  a symbol of modern Athens. Athens is a compact city; it is easy to move around the capital using public transport, and one feels very safe here. Our Olympic guests confirmed this fact last year for the world. It is a vibrant city  there is always something going on. We organise and sponsor various events throughout the year, such as film, music and cinema festivals. We feel it is important to conserve Greek traditions. One can always see interesting art exhibitions at the Technopolis Cultural Centre. At Christmas, we organise events and fairs at the main squares while New Year’s Eve is celebrated with a free open-air concert. Last year we held over 600 free cultural events during the Olympics and Paralympics. This year, we are continuing our summer cultural events programme and we invite everyone to “Join the Fun in Athens” through to 18 September. Visitors can enjoy free outdoor concerts featuring performances of traditional and modern forms of Greek music. Artists from around the world reflect the multi-ethnic flavour of our city. To hear about all that is going on in Athens, visitors can tune into 104.4 FM. I would suggest that visitors see the City’s portal www.cityofathens.gr, where they will find our Strolling Through Athens guide, which is in Greek and English. There, they will find many ideas as to what they can see in Athens. It includes walking routes because the pedestrianisation of Athens and the unification of the capital’s ancient sites have made walking through our city a wonderful experience. Citizens and visitors can now walk through the Archaeological Park and view key ancient sites like the Acropolis, of course, but also the Ancient and Roman Agora, and Kerameikos. The park also includes Byzantine monuments, neoclassical structures and other points of historical significance. I am particularly happy to see this continuing project come to fruition as I worked on it when I was culture minister. Question: What have been the reactions of visitors to Athens this year? Mayor Bakoyannis: This year we have seen a significant rise in the number of visitors. People who saw the Olympics on television had the opportunity to see the new Athens and made the decision to visit. Congress, business meeting and exhibition organisers are also expressing a growing level of interest in the city, and this year we have already seen a marked increase in the number of such events in Athens. 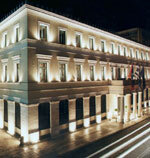 Question: What would you say to those considering a vacation in Athens? Mayor Bakoyannis: Come visit Athens, and I dare you not to fall in love with her! 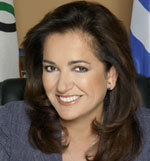 Dora Bakoyannis took office in January, 2003, after being elected the 48th Mayor of Athens in the local government elections on October 20, 2002. With her victory she broke several records that had stood for generations. She is the first woman chosen to lead Athens in the 3,500-year history of Europe’s oldest city. She won by a larger majority  61 per cent - than any Athens mayor in the history of modern Greece. For the past two years, she has been consistently named by opinion polls as the most popular politician in the country. A June, 2004, poll showed that she led the way with a 71 per cent nationwide approval rating. She is the first woman to serve as mayor of a city hosting the Olympic Games. Born in 1954, she is the eldest of four children of veteran Greek statesman Constantine Mitsotakis, 86. He served as prime minister of Greece from 1990 to 1993, leader of the country’s centre-right New Democracy party from 1984 to 1993, and continues as its honorary president. Dora’s mother, Marika Yannoukou, has led the struggle in Greece to improve the rights of people with disabilities. At the age of 14, Dora and her family were exiled to Paris by the military dictatorship, which ruled Greece for seven years. They returned to Athens in 1974, when military rule collapsed. That same year she married Pavlos Bakoyannis, a respected journalist and scholar. They had two children, Alexia and Kostas. Over the next several years, she worked in the Ministry of Economic Coordination and later the Ministry of Foreign Affairs. In 1984, when her father was elected leader of the New Democracy party, she became his Chief of Staff. In 1989, terrorists gunned down her husband, then a deputy in the Greek Parliament, as he was entering his office building. After his death, she stood as candidate for her husband’s seat in the remote mountainous region of Evrytania, and won the election - the first of a series of successful election contests. When New Democracy was elected to government the following year, Dora Bakoyannis served first as the Under-Secretary of State and then as Minister of Culture, when she planned the unification of Athens’ archaeological sites. She was re-elected three times as deputy for Evrytania, and later moved her candidacy to the district of central Athens, where she was elected with a sweeping majority. When New Democracy lost power in 1993, she successfully ran for a seat on its central committee. In 2000, the new leader of the party, today’s Prime Minister, Kostas Karamanlis, appointed her as shadow foreign and defence minister. During her years in Parliament, Dora Bakoyannis spearheaded the public fight against terrorism in Greece, herself, surviving an assassination attempt as Mayor-elect in December 2002. In 2000 a bill was finally passed aimed at strengthening the campaign against Greek terrorists, especially the ‘November 17’ group, which assassinated 23 persons, including her husband and five Americans, between 1975 and 2002. In June 2002 authorities made a major breakthrough that led to the group’s disruption and the arrest of 19 individuals. Most of them confessed and, after a nine-month trial, in December 2003 were sentenced to life imprisonment. Among them are three men who admitted participating in the murder of Pavlos Bakoyannis. In the summer of 2002, when Mr Karamanlis was looking for a way to demonstrate his party’s growing strength against the ruling Socialist Party in local elections, he selected Dora Bakoyannis to go after the biggest challenge of all - taking over the City of Athens. She led a large field of candidates in the first round of the elections on October 13, 2002, winning by a substantial margin, and then soundly defeated her opponent in the runoff a week later with the biggest majority in the city’s history. Upon the invitation of Romano Prodi, then President of the European Commission, Mrs Bakoyannis joined a group of high-level independent figures in January, 2003, as a member of a prestigious round-table conference, contributing to the “Sustainable Project for European Society”. Dora Bakoyannis studied political science and public law at the University of Athens and politics and communications in Munich, Germany. She is fluent in English, French and German. In 1998, she married Greek businessman Isidoros Kouvelos.